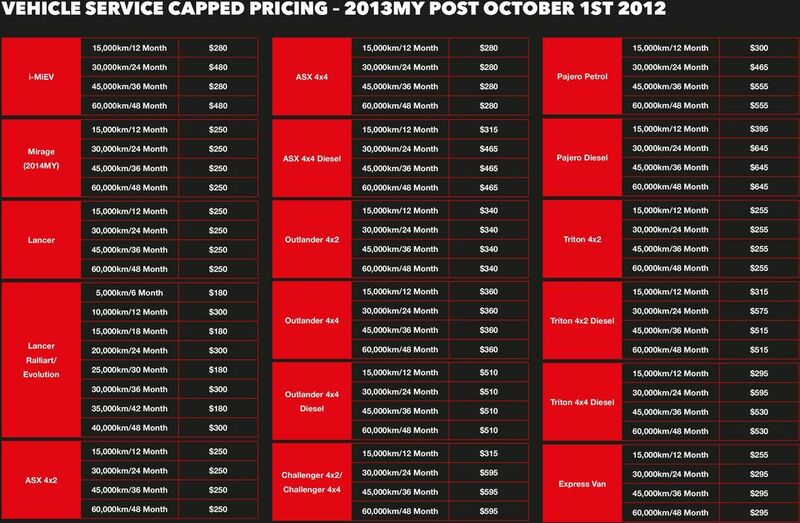 Download "WE VE CAPPED THE PRICE. NOT THE SERVICE." 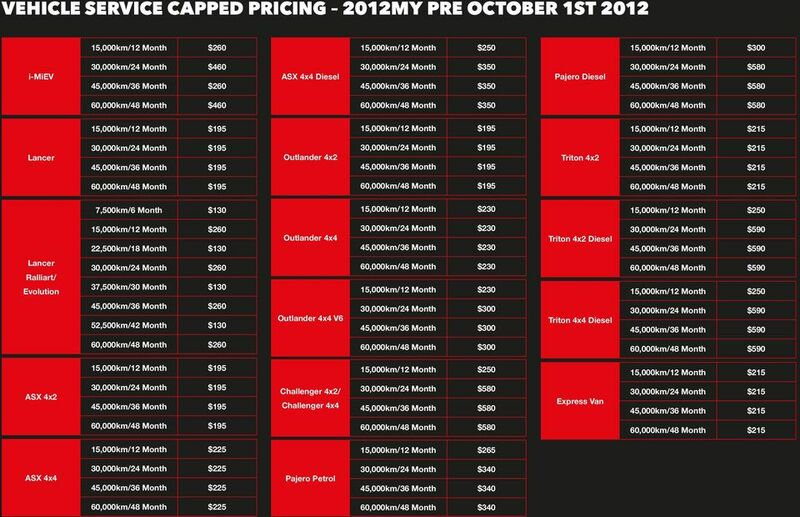 1 WE VE CAPPED THE PRICE. NOT THE SERVICE CAPPED PRICE SERVICING MEANS REAL PEACE OF MIND. 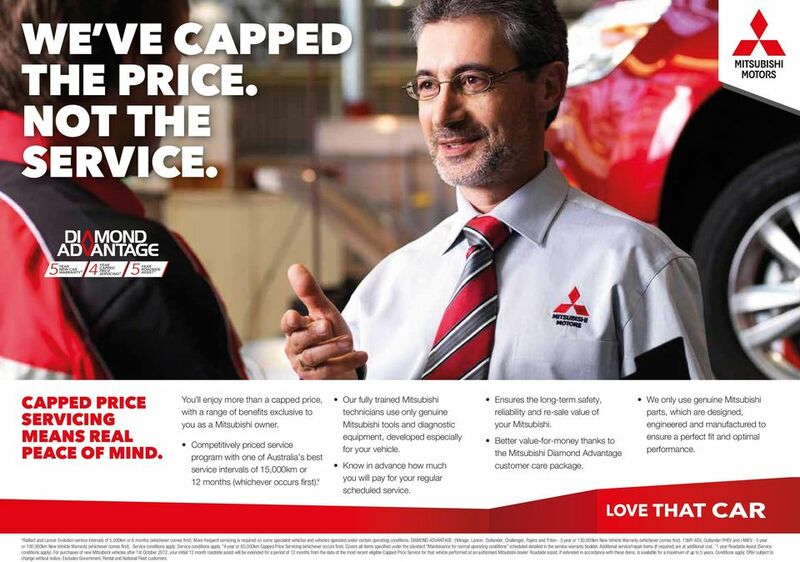 You ll enjoy more than a capped price, with a range of benefits exclusive to you as a Mitsubishi owner. Competitively priced service program with one of Australia s best service intervals of 15,000km or 12 months (whichever occurs first). Our fully trained Mitsubishi technicians use only genuine Mitsubishi tools and diagnostic equipment, developed especially for your vehicle. Know in advance how much you will pay for your regular scheduled service. Ensures the long-term safety, reliability and re-sale value of your Mitsubishi. Better value-for-money thanks to the Mitsubishi Diamond Advantage customer care package. We only use genuine Mitsubishi parts, which are designed, engineered and manufactured to ensure a perfect fit and optimal performance. 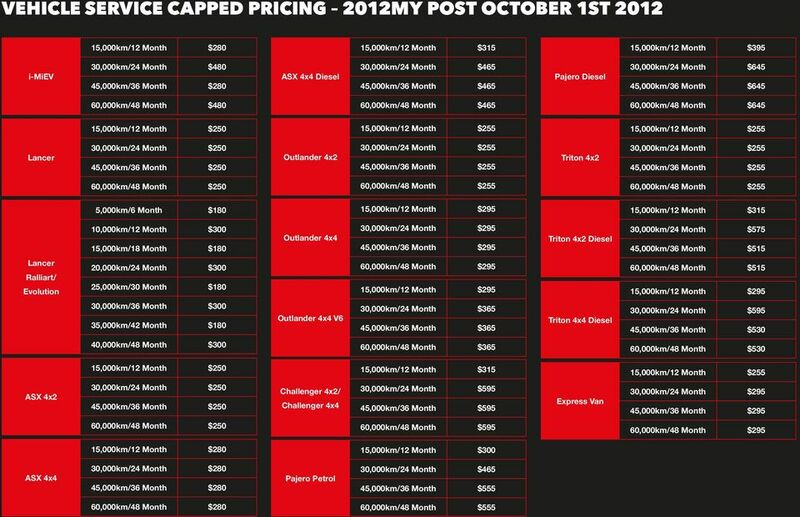 Ralliart and service intervals of 5,000km or 6 months (whichever comes first). More frequent servicing is required on some specialist vehicles and vehicles operated under certain operating conditions. DIAMOND ADVANTAGE: Mirage,, Outlander, Challenger, Pajero and Triton - 5 year or 130,000km New Vehicle Warranty (whichever comes first). 15MY ASX, Outlander PHEV and i-miev - 5 year or 100,000km New Vehicle Warranty (whichever comes first). Service conditions apply. Service conditions apply. 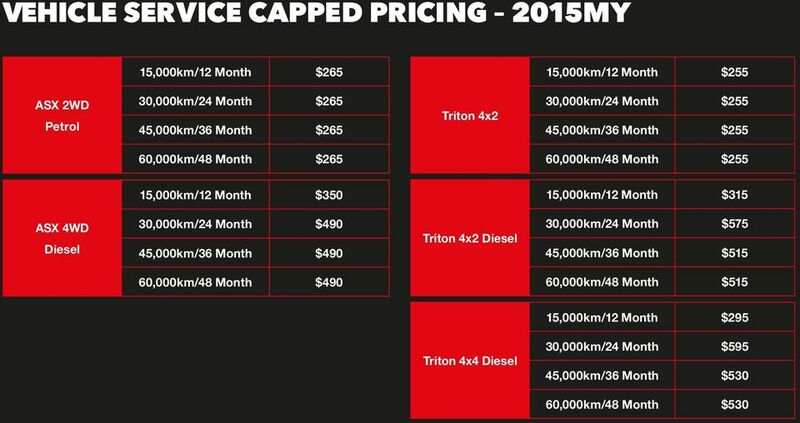 *4 year or 60,000km Capped Price Servicing (whichever occurs first). Covers all items specified under the standard Maintenance for normal operating conditions scheduled detailed in the service warranty booklet. Additional service/repair items (if required) are at additional cost. ^1 year Roadside Assist (Service conditions apply). For purchases of new Mitsubishi vehicles after 1st October 2012, your initial 12 month roadside assist will be extended for a period of 12 months from the date of the most recent eligible Capped Price Service for that vehicle performed at an authorised Mitsubishi dealer. Roadside assist, if extended in accordance with these items, is available for a maximum of up to 5 years. Conditions apply. Offer subject to change without notice. Excludes Government, Rental and National Fleet customers. 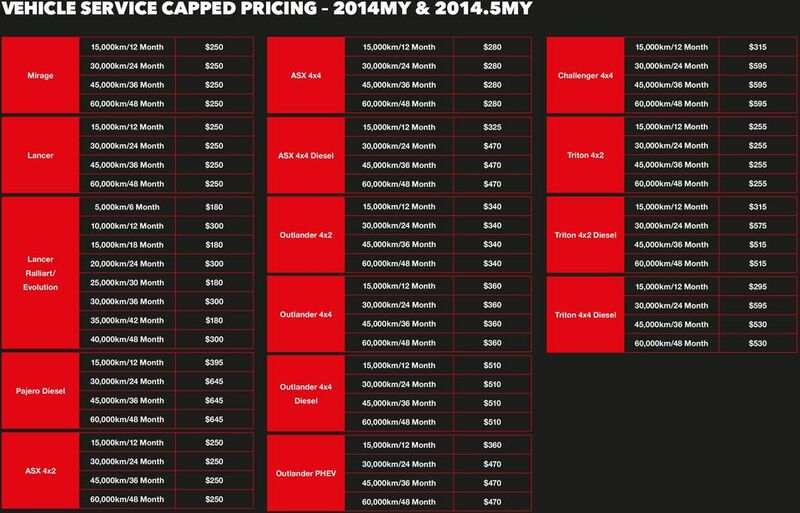 2 CAPPED PRICE SERVICING TERMS & CONDITIONS MMAL means Mitsubishi Motors Australia Limited ABN AUTHORISED MITSUBISHI DEALER means a dealer appointed by Mitsubishi Motors Australia Limited to sell new and/or demonstrator vehicles of the kind marketed from time to time by Mitsubishi in Australia and/or authorised to perform Mitsubishi warranty service on such vehicles. MITSUBISHI SPECIALIST SERVICE CENTRE means a dealer appointed by Mitsubishi Motors Australia Limited to service Ralliart,, Outlander PHEV or i-miev vehicles of the kind marketed from time to time by Mitsubishi in Australia and/or authorised to perform Mitsubishi warranty service on such vehicles. SERVICE AND WARRANTY CUSTOMER INFORMATION BOOKLET means the official Mitsubishi Service and Warranty Customer Information booklet supplied with the vehicle at the time of purchase, which includes warranty and maintenance records. MITSUBISHI VEHICLE(S) means a Mitsubishi branded vehicle imported by MMAL and distributed in Australia. THE PROGRAM means MMAL Capped Priced Servicing. WARRANTY START DATE is the corresponding warranty start date recorded in the Mitsubishi vehicle database. 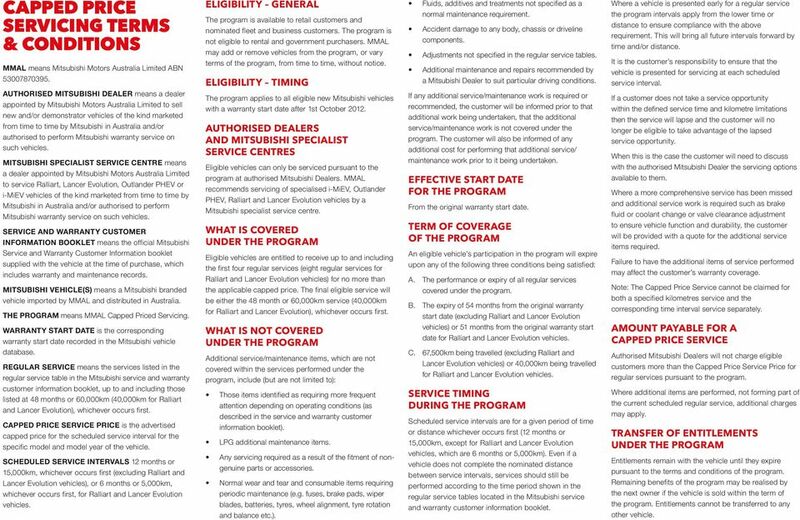 REGULAR SERVICE means the services listed in the regular service table in the Mitsubishi service and warranty customer information booklet, up to and including those listed at 48 months or 60,000km (40,000km for Ralliart and ), whichever occurs first. 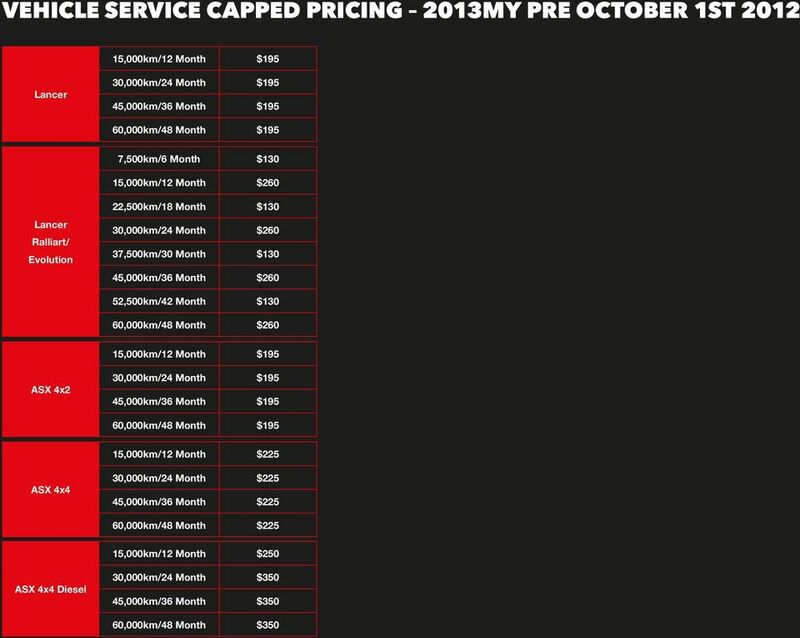 CAPPED PRICE SERVICE PRICE is the advertised capped price for the scheduled service interval for the specific model and model year of the vehicle. SCHEDULED SERVICE INTERVALS 12 months or 15,000km, whichever occurs first (excluding Ralliart and vehicles), or 6 months or 5,000km, whichever occurs first, for Ralliart and vehicles. ELIGIBILITY GENERAL The program is available to retail customers and nominated fleet and business customers. The program is not eligible to rental and government purchasers. MMAL may add or remove vehicles from the program, or vary terms of the program, from time to time, without notice. ELIGIBILITY TIMING The program applies to all eligible new Mitsubishi vehicles with a warranty start date after 1st October AUTHORISED DEALERS AND MITSUBISHI SPECIALIST SERVICE CENTRES Eligible vehicles can only be serviced pursuant to the program at authorised Mitsubishi Dealers. MMAL recommends servicing of specialised i-miev, Outlander PHEV, Ralliart and vehicles by a Mitsubishi specialist service centre. 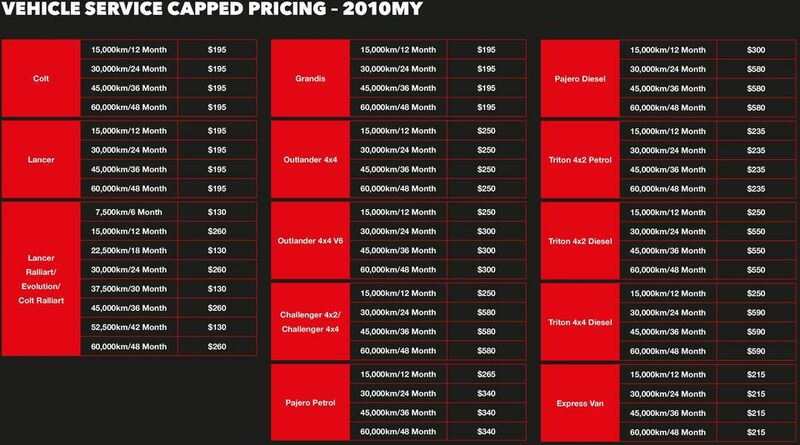 WHAT IS COVERED UNDER THE PROGRAM Eligible vehicles are entitled to receive up to and including the first four regular services (eight regular services for Ralliart and vehicles) for no more than the applicable capped price. The final eligible service will be either the 48 month or 60,000km service (40,000km for Ralliart and ), whichever occurs first. WHAT IS NOT COVERED UNDER THE PROGRAM Additional service/maintenance items, which are not covered within the services performed under the program, include (but are not limited to): Those items identified as requiring more frequent attention depending on operating conditions (as described in the service and warranty customer information booklet). LPG additional maintenance items. Any servicing required as a result of the fitment of nongenuine parts or accessories. Normal wear and tear and consumable items requiring periodic maintenance (e.g. fuses, brake pads, wiper blades, batteries, tyres, wheel alignment, tyre rotation and balance etc.). Fluids, additives and treatments not specified as a normal maintenance requirement. Accident damage to any body, chassis or driveline components. Adjustments not specified in the regular service tables. Additional maintenance and repairs recommended by a Mitsubishi Dealer to suit particular driving conditions. If any additional service/maintenance work is required or recommended, the customer will be informed prior to that additional work being undertaken, that the additional service/maintenance work is not covered under the program. The customer will also be informed of any additional cost for performing that additional service/ maintenance work prior to it being undertaken. EFFECTIVE START DATE FOR THE PROGRAM From the original warranty start date. TERM OF COVERAGE OF THE PROGRAM An eligible vehicle s participation in the program will expire upon any of the following three conditions being satisfied: A. The performance or expiry of all regular services covered under the program. B. The expiry of 54 months from the original warranty start date (excluding Ralliart and vehicles) or 51 months from the original warranty start date for Ralliart and vehicles. C. 67,500km being travelled (excluding Ralliart and vehicles) or 40,000km being travelled for Ralliart and vehicles. SERVICE TIMING DURING THE PROGRAM Scheduled service intervals are for a given period of time or distance whichever occurs first (12 months or 15,000km, except for Ralliart and vehicles, which are 6 months or 5,000km). Even if a vehicle does not complete the nominated distance between service intervals, services should still be performed according to the time period shown in the regular service tables located in the Mitsubishi service and warranty customer information booklet. Where a vehicle is presented early for a regular service the program intervals apply from the lower time or distance to ensure compliance with the above requirement. This will bring all future intervals forward by time and/or distance. It is the customer s responsibility to ensure that the vehicle is presented for servicing at each scheduled service interval. If a customer does not take a service opportunity within the defined service time and kilometre limitations then the service will lapse and the customer will no longer be eligible to take advantage of the lapsed service opportunity. When this is the case the customer will need to discuss with the authorised Mitsubishi Dealer the servicing options available to them. Where a more comprehensive service has been missed and additional service work is required such as brake fluid or coolant change or valve clearance adjustment to ensure vehicle function and durability, the customer will be provided with a quote for the additional service items required. Failure to have the additional items of service performed may affect the customer s warranty coverage. Note: The Capped Price Service cannot be claimed for both a specified kilometres service and the corresponding time interval service separately. 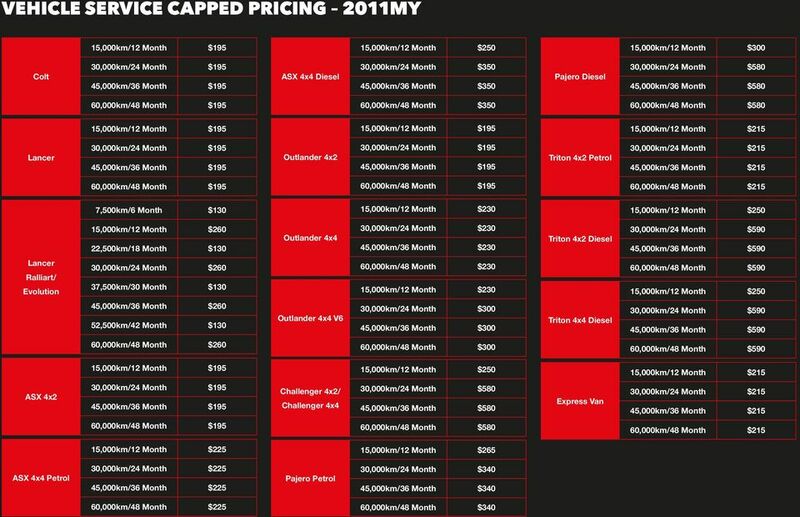 AMOUNT PAYABLE FOR A CAPPED PRICE SERVICE Authorised Mitsubishi Dealers will not charge eligible customers more than the Capped Price Service Price for regular services pursuant to the program. Where additional items are performed, not forming part of the current scheduled regular service, additional charges may apply. TRANSFER OF ENTITLEMENTS UNDER THE PROGRAM Entitlements remain with the vehicle until they expire pursuant to the terms and conditions of the program. Remaining benefits of the program may be realised by the next owner if the vehicle is sold within the term of the program. Entitlements cannot be transferred to any other vehicle. BMW Premium Selection. Used Vehicles. FOR A MORE REWARDING JOURNEY. Drive with confidence. Mercedes-Benz Prepaid Maintenance.